Suddenly the investors are a little green and I'm helping Tim try to revive a man who is a little too dead. The man turns out to be the FDA inspector Tim had been seen fighting with and Tim is arrested for murder. Well, there's no way Tim would hurt a fly. He doesn't like germs and death is messy. So I set out with my trusty cat Clemmy to figure out who really killed the inspector and why Tim's girlfriend Mandy is hanging out with a self-help guru. Is there a connection? Not to mention my Aunt Jemma suddenly going off the rails as she tries her hand at a seance. Ghosts, gurus, and murder all mix to make me wish I could go back to my advertising job in San Francisco. My author has two ARC's she's willing to give away. Leave a comment below and tell us if you like wine or if you think it's all just sour grapes for a chance to win. Good luck! What a horrible way to die! Poor Tim! Yes, I do enjoy wine and the entire process, from grapevine to glass, is extremely interesting. Thank you for a chance to win the next book in this enjoyable series! Sounds amazing. I love wine and have enjoyed many a bottle. 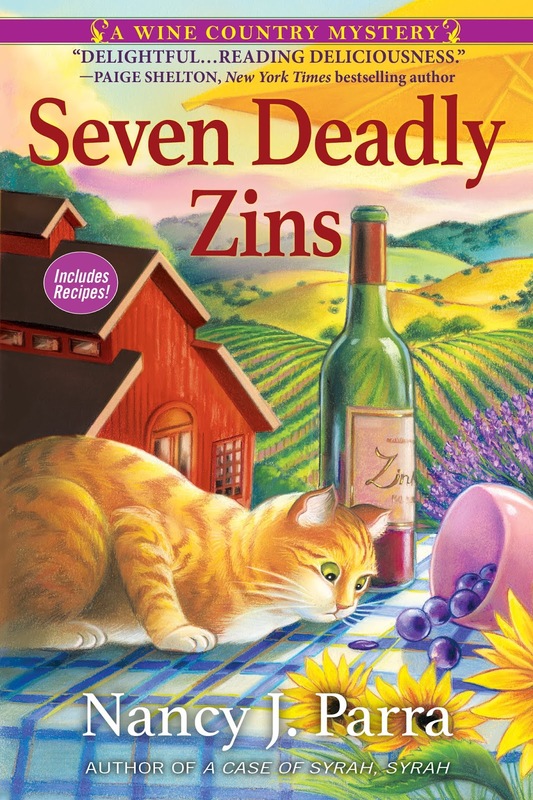 Can't wait for the opportunity to read "Seven Deadly Zins". Adorable cover! Would love to read more about Taylor and Clemmy. Thank you for the chance to win an ARC! I love Whie Zinfandel and White Merlot!!! I've only ever tried white wine and didn't like it. I'd like to try a red wine sometime to see if I like it more. Well, I wouldn't go so far as to say it's sour grapes. I will drink wine socially if someone else offers, at least have a glass of it. But tea is much more to my liking. I'm not a wine drinker. I've never met a wine that didn't give me a killer headache after just a few sips. But I love a number of books that have a winery setting. I do like wine and I really enjoy winery tours and tastings. This is a series that's on my TBR list, looking forward to reading "Seven Deadly Zins". Wine is lovely and visiting wine country is delightful. I love wine---and enjoy trying all kinds. I'm going crazy getting different wines at the local fall wine sales. I enjoy sampling different wines. I love wine, and this series is awesome.. I cannot wait to read this latest installment...the cover art is beautiful! Thank you! Cozynky(at)Gmail(dot)com. I'm not normally a wine drinker, it gives me a headache. I like wine, white wine, especially pinot grigio. Thanks for a chance to win. Hi Doward, You won! I'll contact you soon. I'd rather have raspberry spritz champagne! Since that's out of the question (cost) I'll just be happy with Bud Lite! I have no problem reading about wine as long as there is a cozy mystery involved! I like wine, but mainly white. Thanks for the chance. We enjoy wine, especially dry and white. Thanks for the opportunity. I like sweet wines, but don't drink very often dye to chasing a toddler! I loved your first book and am excited for this one! Love wine! So great to have a glass at night after a long day and/or with friends. I am allergic to all alcoholic drinks, but I do drink a lot of coffee and sweet ice tea. Thanks for the interview and giveaway! Sheryl, you won! Hope this isn't too late. Email me at nancyjparra@yahoo.com. I don't drink due to an allergy to alcohol but, when I did, I was never that fond of wine. I did drink it, though, to be socialable. I like Moscato like peach arbor mist.Thanks for the chance.